"Downsized!" is the twenty-ninth comic issue, which was released 31 January, 2007 in the US. Fry, Leela, and Bender are sent on a mission to deliver glass cleaner to the city Glassopolis. The city is a small glass bottle inhabited by small humans. Using the Shrinky Dinky Fun Slide, the crew shrinks down small enough to enter the city. While they’re in the city they attend the Great Recycling ceremony. In the ceremony, people that have turned thirty are put into an arena and eventually a garbage disposal for population control. After it is learned that Fry and Leela are thirty, they are forced into the arena. Bender shows the movie Logan’s Run to prevent Fry and Leela getting killed but he steals the crowd's wallets and they chase the crew to the end of the bottle. The crew knocks Glassopolis off the table because Fry hits the edge and it falls on the floor. Amy slips on the bottle, and it rolls into the street. After the chaos, the city is destroyed and the Glassopolians must find a new place to live. Since the size of the people on Earth is too dangerous, they decide to use their doomsday devices to destroy Earth. Fry, Bender and Leela escape to Planet Express using dog fleas to ride on and Professor Farnsworth uses the Laffy Daffy Taffy puller to enlarge them, a reference to Charlie and the Chocolate Factory. Fry finds the bottle and has to give the people of Glassopolis a new home to prevent the detonation of the world. He uses snowglobes which satisfy them and Bender drinks all the water. Professor Farnsworth's eyes seen for the first time. Professor Farnsworth’s eyes are shown for the first time anywhere, but it is unknown if Matt Groening authorized the reveal. 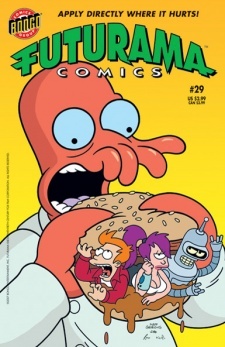 It is revealed that Fry and Leela are thirty years old which set the comic in 3005. Professor Farnsworth: Eveyone spread out and get looking! The first person to find the bottle city and save Earth gets a hug! This page was last edited on 5 November 2017, at 18:58.